Hey Friends! 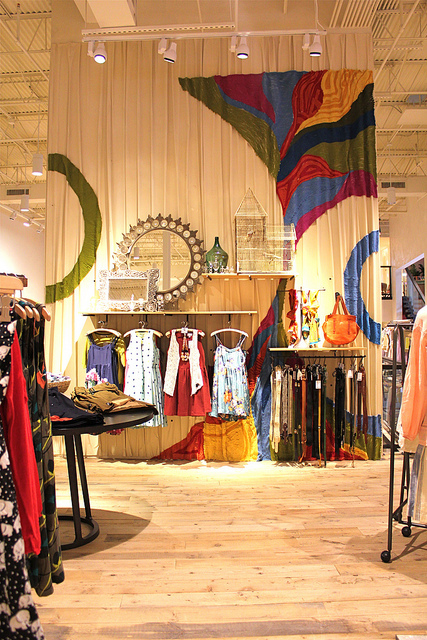 Many of you know that I worked as the Display Coordinator at Anthropologie a while back. Generally when people find out that I worked there, many questions follow. There is a lot of curiosity about what goes on behind the scenes at the seemingly dreamy Anthro brand! Well today I am here to pull back the ruffly curtain and give you all the details about being a display artist for this esteemed organization. First of all, I am always surprised when I find people who don’t know what Anthropologie is. 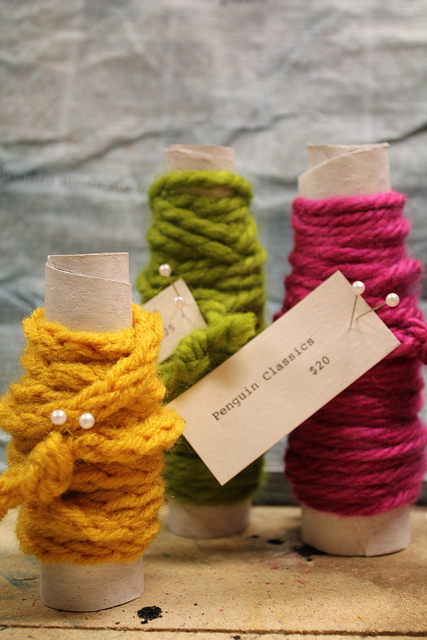 If you are one of those people, you should definitely go and check these stores out. 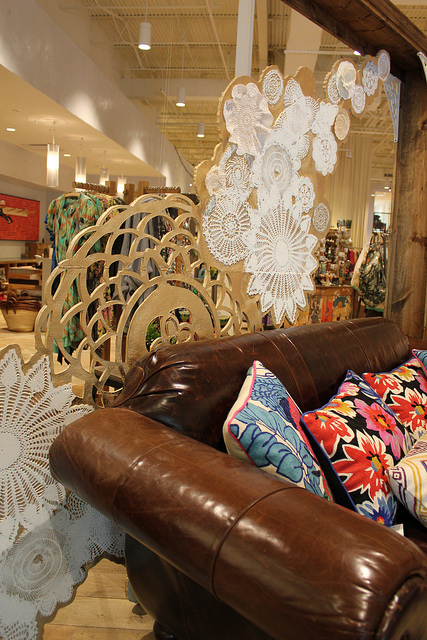 Anthropologie sells women’s apparel and home decor items. The home decor items are very unique, adorably whimsical, and simply beautiful. 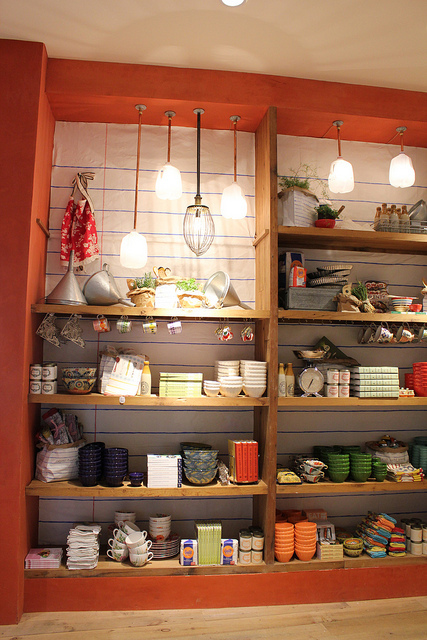 From tiny teaspoon sets to stunning wallpapers, Anthro’s products will inspire and delight you. 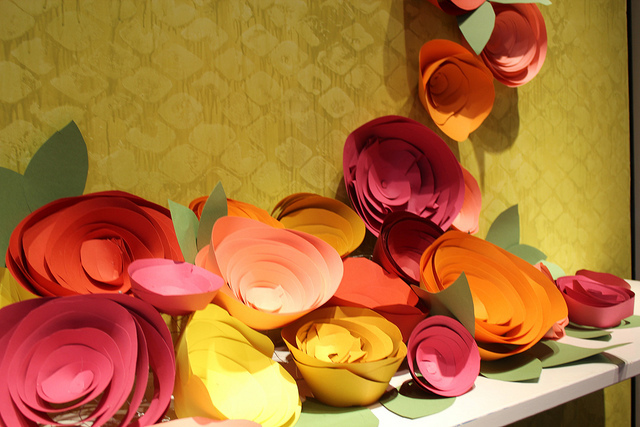 And as if their products aren’t enough, Anthro also places a high emphasis on creating amazing displays that transform their stores from retail spaces to art galleries. From massive installations to the tiniest detail, Anthro goes above and beyond to give their customers a stiring experience. Of course, as with any company or job, not everything is rainbows and roses. 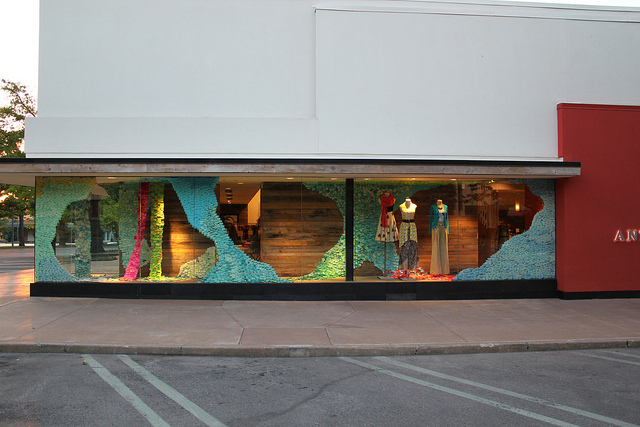 So, here’s everything you ever wanted to know about what goes on behind the scenes at Anthropologie. What is a Display Coordinator (DC) and a Visual Manager (VM)? The display coordinator and the visual manager work together to come up with the display designs and installations that will transform the store. 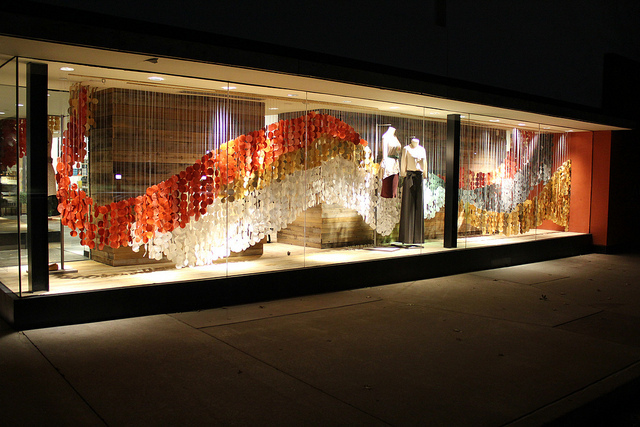 The display coordinator is more in charge of coming up with and constructing installations for the windows and displays inside the store while the visual manager is more in charge of merchandising the displays once they are complete. In the hierarchy of Anthro, the visual manager is above the display coordinator. How do I get the display coordinator job? Generally, Anthro only considers graduates with art degrees for this position. However, sometimes exceptions are made for individuals with a large portfolio showing that they have the skills necessary for the job (as it was with me). The main thing that will help you to land this position is having a large body of previous work that shows not only your creative talents, but your abilities to actually construct and turn abstract ideas into real pieces. Just being an idea gal or guy will not cut it for this position. You have to get your hands dirty. Do you really get a whole workshop to create your displays in? Before I got the job I had heard that display coordinators got their own workshop. I was envisioning a rather large space where I could really create and build some larger structures. Well that was not reality. I did have my own workspace, but it was rather small and the number of tools available to me was very limited. As a matter of fact, I would often bring my own tools from home because I didn’t have what I needed at work. I was happy to at least have a space that I could shut the door to and make my own. 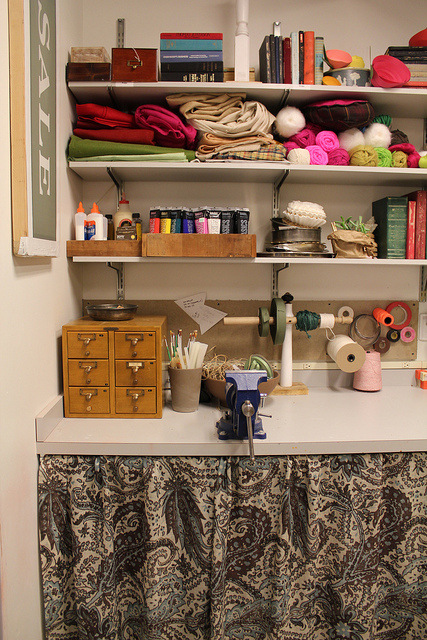 Click here to see what my whole office/workshop looked like while I was at Anthro. How often are displays changed at Anthro? 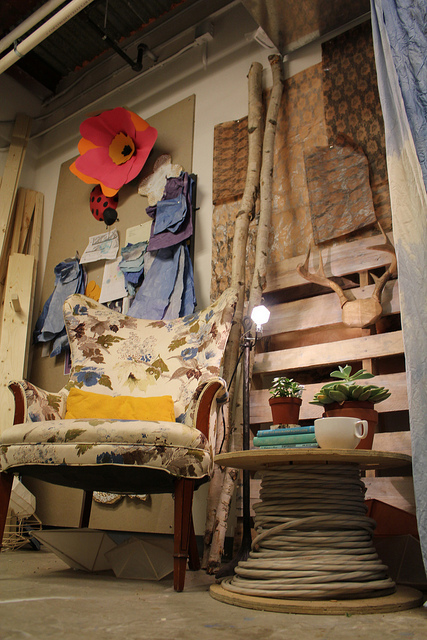 Something is always being worked on at Anthropologie. The windows change every 6-8 weeks and the displays inside the store are constantly being rotated, modified, or completely changed. Does the Anthro corporate office come up with the displays? How does that process work? So, for many large corporations, the home offices will come up with the store displays and send pictures and supplies to all the stores for the employees to copy. For each display at Anthropologie, the home offices come up with a concept and send out inspiration photos and/or mood boards for these concepts. 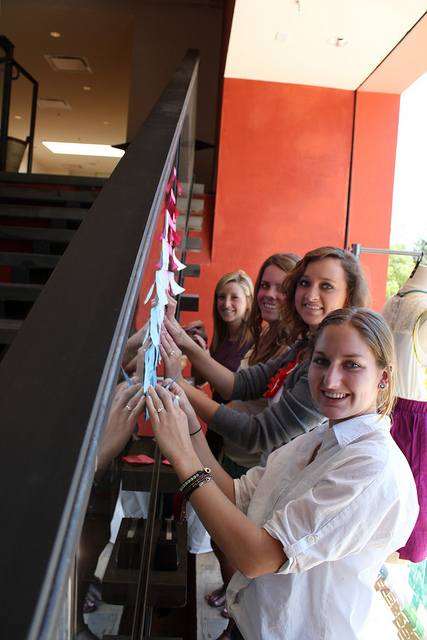 Based on the concepts, a display coordinator will start to think of ideas and installations. Not long after the concept is pitched and the inspiration sent, the home offices will then send out pictures of completed displays that a few select DC’s have already completed. These completed displays can serve as further inspiration or a DC can choose to copy the display almost exactly. Before any work is started, the DC must create sketches that have to be approved by both the store’s Visual Manager and a regional visual manager. This can sometimes be a frustrating and long process. If you are considering taking a DC position, really try to figure out if you and the VM will mesh before you accept the job. Do you have a huge budget to create displays? Going into the job, I expected to have a good chunk of change to complete these massive displays. Not the case. Generally the budgets are not large. They are doable, but not extravagant by any means. This is why you see Anthro use paper for so many of it’s creations. Paper is super cheap, readily available, and easy to manipulate. 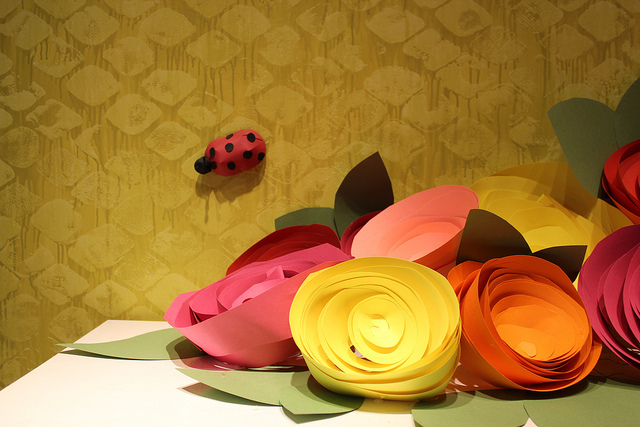 You can create so many varying looks with paper, it’s an ideal medium for a small budget. How come some Anthro stores are so much more inspiring than other ones? Of course the quality of work and level of inspiration at each store can be contributed to the talent level or overall passion of the DC and VM at that store, but another huge factor is the size of the workforce. Some of the larger stores employ multiple Display Coordinators and have tons of interns year round. The NYC stores for example have multiple people on their display team- hence the amazingly huge and intricate displays that just aren’t feasible for the lone artist in the smaller stores. 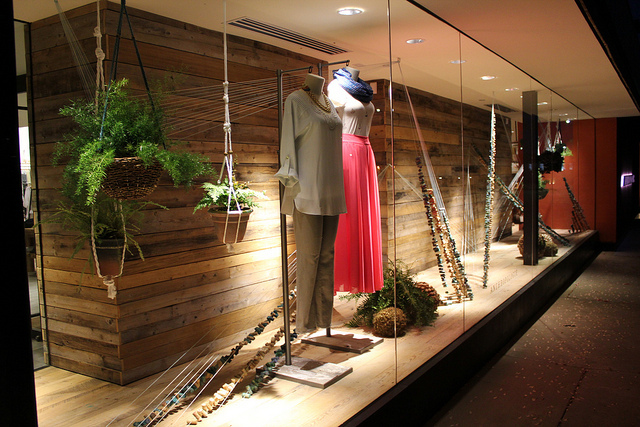 The summer I was at Anthro, I hired 5 interns and my displays during that time were sooooooo much better! 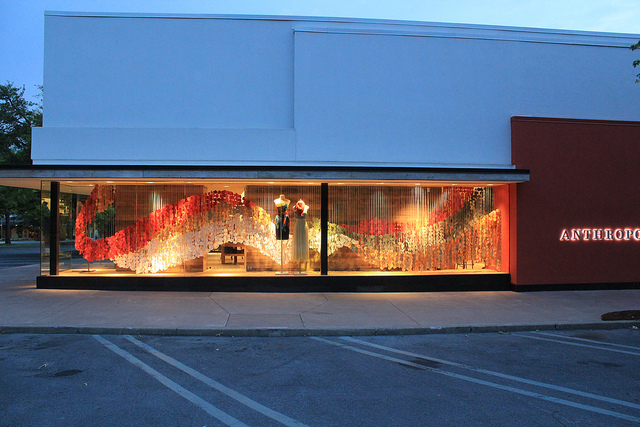 For example, here is a window I created when I had no interns and no help! That is a massive window to fill and make an impact in when you’ve got one person stringing corks. Definitely my least favorite window I did. But when you have lots of hands, you can make a much more impactful display! Here are two windows I did when my interns were around. . . This job sounds dreamy! What are the negatives to the job? Landing this job was a dream come true for me, but I quickly learned that their were parts to it that weren’t ideal for me. Here are some interesting facts about the position that will help you decide if it’s really a position you would enjoy long term. – The Hours- This is not a freelance, come and go as you please job. It’s a 40 hour week, 6am-3pm job. You get a one hour lunch and no overtime. When I accepted the job, they made it seem like the hours were flexible. Don’t let them fool you. It is not flexible, not in the least. For a person coming from a position of being their own boss and making their own schedule, this can be a big drawback. I’m the type of person that may arrive a 15 minutes late, but I’ll stay an hour later at the end of the day. This type of flexibility is not allowed at Anthro and is definitely something to think about if you’re considering a position there. – The Hierarchy- The hierarchy of the company can daunting at times. Getting a display approved by multiple people with different ideas can be draining. If you love collaboration, you will love this job. -The Pay- I’ll just be honest. In my opinion, for what display coordinators do for the Anthro store and the brand, the pay stinks. $15 an hour does not go very far in today’s world, but it is a steady job (which can be difficult for artists to find). – The Intellectual Property Issue- Most of the inspiration for displays come from artists and bloggers found on the internet. That’s fine if the projects and pieces really do just serve as inspiration, but not ok if the ideas are just ripped off and copied exactly, which does happen at some of the Anthro stores. I wouldn’t mind it if there was a way to credit to the person who came up with the idea, but I haven’t ever seen a display coordinator bother with that (and I am not sure corporate would let them even if they wanted to). -The Creativity- The job is not as creatively flexible as you might think. Mutiple times I was encouraged to just copy the inspiration displays. I hated that! I did not take that job to replicate someone elses ideas. I took it to create new ideas, to create something all my own. This was a big reason I decided to leave the position. PS- You can see all the displays I created while at Anthro right here. 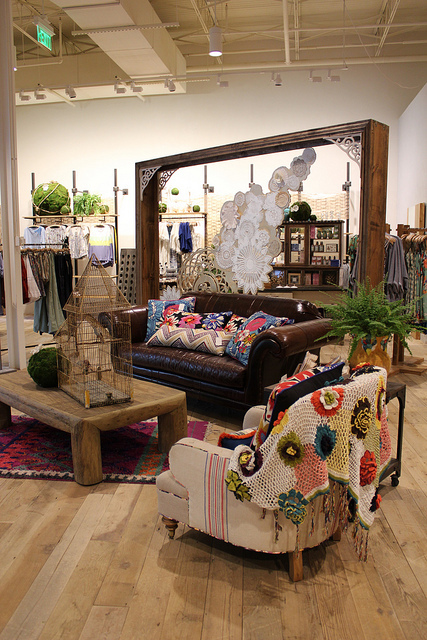 I just started working for Anthropologie’s call center a few months ago, I knew of Anthropologie but I had never seen the displays, unfortunately there is no Anthro near me. These are gorgeous, this would be my dream job but I am nowhere near being qualified, just an artist for the love and hobby! And I just wanted to say I love your work!! Its amazing..
Hi! I really hope you see this and maybe email me. I’m 14 years old and a soon to be sophomore in high school. I’ve always know what I wanted to be but obviously that changed. I’d love to be an FBI profiler and agent… but I’ve also wanted to be a set designer for years now. I think set design in itself is amazing and I would also love to just design the windows for anthro. I want to do more too obviously but I can’t describe how much I’d love to design and create them. I’ve been looking at it a lot recently. I just recently started sketching some stuff just ideas off things and displays. Any advise or ya know anything? I’m a really artsy and indie kinda person and I’ve kinda got wide horizons and I’m all over the place when it comes to things I like to do. I’d love to get in contact with you.